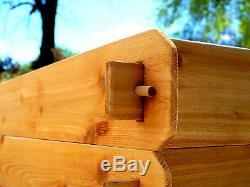 Two Tiered Western Red Cedar Raised Garden Bed Mortise & Tenon Joinery. No screws, tools or pounding into the ground! A tried & true design that has been used for generations. Simply the easiest raised beds to put together. Beds can be assembled and ready to plant in as little as 5 minutes. Perfect for children, seniors, busy families or those with debilitating conditions such as arthritis. Each board is inspected numerous times throughout the building process. You won't find twisted, warped, or cracked boards here, or those with knots falling out! 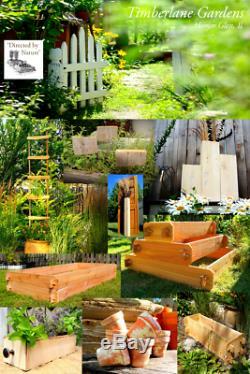 Made from 100% natural untreated Western Red Cedar, the professional gardeners' choice of material. Naturally rot & insect resistant. 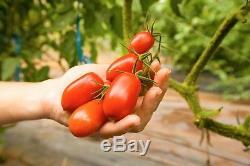 The best choice for organic vegetable gardening. 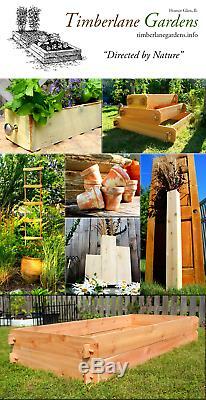 Mix and match with our ever expanding selection of beds and planters as your garden grows! Includes two individual raised beds. Use them separately or stack them for one extra deep bed. Dimensions: 1 Feet Wide x 6 Feet Long x 6 Inches Deep 2 Feet Wide x 6 Feet Long x 6 Inches Deep Inner planting dimensions a bit smaller due to the mortise & tenon joints. A smaller footprint perfect for a smaller yard! Constructed of Western Red Cedar (Rough sawn). Hand cut, fitted and finished mortise and tenon joinery. A beautiful two tiered gardening bed. 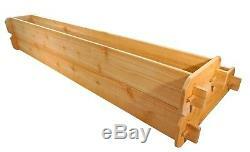 Use as two separate beds or stack them as one double tiered bed. Deep beds allow more planting in a smaller space, such as Square Foot Gardening. MADE in AMERICA with American materials. Add a touch of Old World style & charm to your garden oasis! Made of highly revered and durable Western Red Cedar. 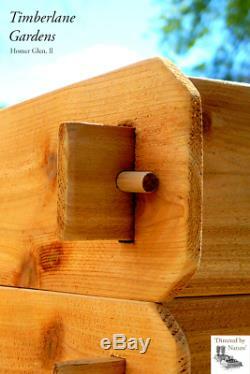 The Hand Crafted Mortise & Tenon joints are the strongest available. Extremely durable and easy to assemble, they will last for many, years. 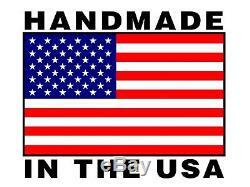 The most affordable authentic hand made beds on the market! Made in Homer Glen, Illinois USA Constructed of Western Red Cedar Hand Crafted Mortise & Tenon Joinery Easy to Assemble, No Tools Required. All cedar is not created equal. Cedar is a broad term that can refer to a number of different wood species, and none of them have the same decay and weather-resistance properties as Western Red Cedar, the species containing natural chemical compounds that make it rot and disease resistant. However, vague naming practices can lead to confusion and deception when trying to make the best choice. Aromatic Cedar is actually a variety of juniper tree thats marketed under the name Aromatic Red Cedar. Port Orford Cedar is actually a variety of cypress and its not what youre looking for either, if you desire true cedar. Cedars are also imported from overseas, most notably Chinese cedar, explaining why exporters are eager & happy to trade on the reputation of authentic cedar. Where is your cedar coming from! Western red cedar is the most abundant cedar available in the U. Primarily grown in British Columbia, it also can be found in western Washington and Oregon. Western red cedar is also the clearest and most decay resistant cedar. Its abundance and properties make the species popular across the country. Western Red cedar is the dominant choice in the Northeast due to natural characteristics of the product that make it very stable, durable and weather resistant. Western Red Cedar is twice as stable as other softwood species. The natural oils are resistant to insects and decay. 'We are proud to help our community of friends and neighbors by offering kindly guidance and the essential ingredients to help succeed in our gardening adventures. This item comes from a smoke-free environment. View My Other Items Here. Nothing screams summer like heading out into your garden to see plump tomatoes turning on the vine. Fat, ripe cucumbers and peppers ready to be picked. Or freshly snipped herbs filling the air with their captivating aroma. Little compares to the satisfaction of a bountiful harvest, after a long season of nurturing and support. And nothing brings us more joy than sharing this experience with others. The item "TIMBERLANE GARDENS Cedar Raised Garden Bed Kit Tiered Planter Patio Deck Flower" is in sale since Thursday, January 25, 2018. This item is in the category "Home & Garden\Yard, Garden & Outdoor Living\Gardening Supplies\Plant Care, Soil & Accessories\Baskets, Pots & Window Boxes". The seller is "delias-deals" and is located in Homer Glen, Illinois. This item can be shipped to United States.